On Monday, July 8, I took Coop-man for his 1 year well-baby visit. Matt couldn't take the morning off of work, so Gigi came with us since it was a shot visit. It was during Cooper's nap time, but he really did GREAT at this visit. Basically, Cooper is suuuuper proportional. Which is great! It also means that he is really not topping the scales anymore. While he started out at the top of the charts, he's more towards the "average" end of things now. He's evening out. She was 20 lbs 10 oz - so he's 3 lbs 9 oz heavier. She was 30 3/4 inches tall - so he is 1/4" shorter. Her head circumference was 17 1/2 inches - so his head is 1" bigger. Showing off his big belly. 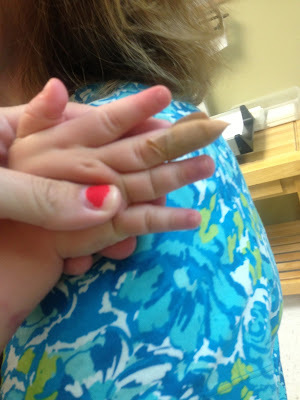 -They checked his hemoglobin level by pricking his finger. To this day, this is still the worst part of the visit with LL. I was totally prepared for Cooper to lose it, but I was pleasantly surprised! He didn't make a peep! He watched very intently as the girl pricked his finger (and squeezed out some blood), but he never fussed about it at all! I was shocked! He didn't even care when she put the bandaid on him. -Once they heard he didn't cry, it seemed like everyone in the office came in to see him and they all were just falling for his charms. He's a lady's man for sure! He had all of those women wrapped around his finger (haha). 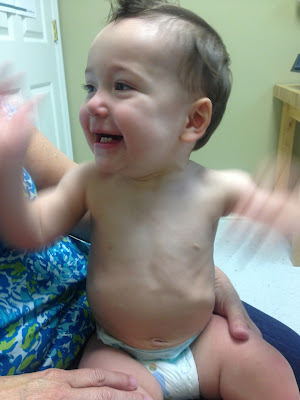 -His hemoglobin level came back just under normal. They look for it it be at 11.5 and his was at 11 - so he's mildly anemic. This just means that we're are concentrating on giving him more iron rich foods, and we're also giving him a multi-vitamin with iron every day. I'm hoping that it will be up to the normal level at his next visit! -She felt on his feet (like on the bottom) and said that he has very good feet (??). I'm assuming that she was feeling his arch?? -She said his soft spot was doing good and that it's closing up nicely. -She looked at his eyes with her light and the ARE still hazel. While the inside around his pupil is brown, the outsides are still a dark blue/grey. 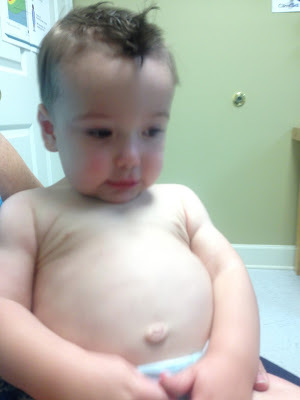 -He did get 4 shots and this part he was not happy about. This time he let them know how he felt! 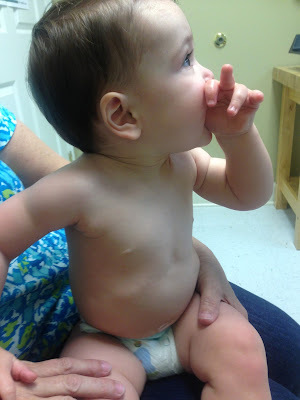 It was a great appointment, and we go back in October for his 15 month appointment!